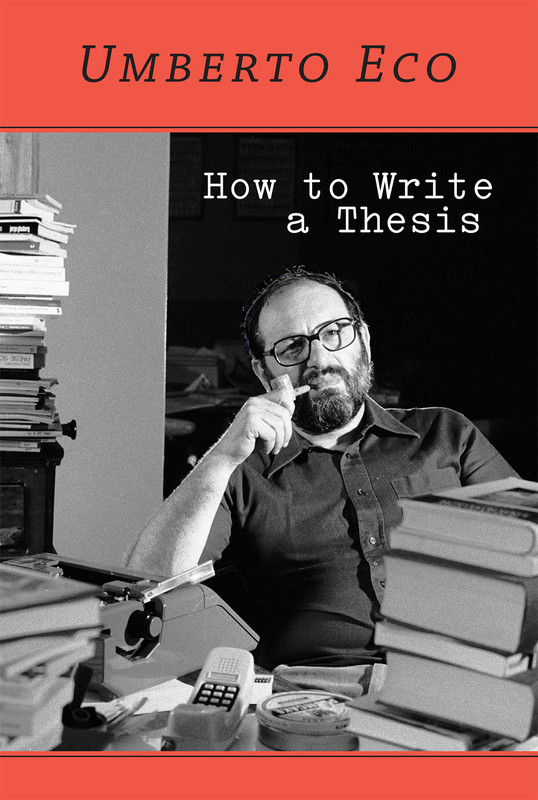 Italian semiotician and novelist Umberto Eco released How to Write a Thesis in 1977, well before his rise to international intellectual stardom. It has just been released in English for the first time by MIT Press. I’ve just read it. From How to Write a Thesis [1977/2015], selected by me. These are slightly paraphrased to make them work in a list. I hope you like them as much as I did. Academic humility is the knowledge that anyone can teach us something. Practice it. A thesis is like a chess game that requires a player to plan in advance all the moves he will make to checkmate his opponent. How long does it take to write a thesis? No longer than three years and no less than six months. Imagine that you have a week to take a 600-mile car trip. Even if you are on vacation, you will not leave your house and begin driving indiscriminately in a random direction. A provisional table of contents will function as your work plan. You must write a thesis that you are able to write. Your thesis exists to prove the hypothesis that you devised at the outset, not to show the breadth of your knowledge. What you should never do is quote from an indirect source pretending that you have read the original. Quote the object of your interpretive analysis with reasonable abundance. Use notes to pay your debts. You should not become so paranoid that you believe you have been plagiarized every time a professor or another student addresses a topic related to your thesis. If you read the great scientists or the great critics you will see that, with a few exceptions, they are quite clear and are not ashamed of explaining things well. You are not Proust. Do not write long sentences. The language of a thesis is a metalanguage, that is, a language that speaks of other languages. A psychiatrist who describes the mentally ill does not express himself in the manner of his patients. If you do not feel qualified, do not defend your thesis. Do not whine and be complex-ridden, because it is annoying. This entry was posted on Tuesday, March 24th, 2015 at 9:18 am	and is filed under Uncategorized.